Even before the interview began, both Sisters spoke of the excellence of the education they received and the many superb instructors they had. Their paths to degree completion were very similar to those of Sr. Mary Catherine Wenstrup, Sr. Deborah Harmeling, and Sr. Christa Kreinbrink, the Benedictine sisters I interviewed in spring 2015. After just one year of classes, Sr. Evelynn and Sr. Mary Claire, both 19, were assigned to teach full time. Sr. Evelynn was just 10 years older than the 57 students in her fifth-grade class. Sr. Mary Claire had 34 third-graders in her class, and she loved them all. Both Sisters had made the decision to enter the convent before beginning college. It was especially interesting that Sr. Mary Claire became a member of the SND community very early, living as an Aspirant at St. Joseph Heights while earning her high school diploma at Notre Dame Academy in Covington. 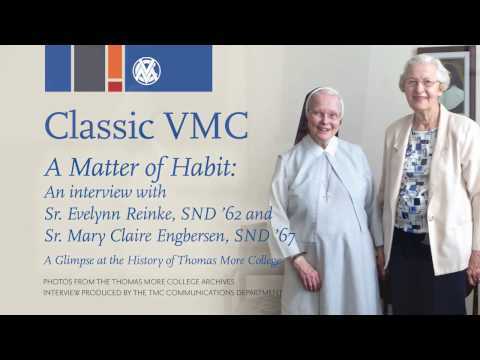 She already had a tie to the convent and Villa Madonna College because Sr. Mary Casimira (later changed to Sr. Rita Marie Mueller) was Sr. Mary Claire’s first cousin and a popular instructor in TMC’s chemistry department for many years. Once Sr. Mary Claire began teaching, the remainder of her college work was accomplished in the summer, on weekends, and/or in the evenings. Sr. Evelynn, meanwhile, completed three years in the elementary classroom then returned to VMC full time for two years. Theirs was a very different experience from that of the typical lay student in the 1960s. For religious women, college was hard work, similar to today’s returning students who often juggle a career and family responsibility along with their courses. Sr. Evelynn noted that, in the summer, the campus was mainly black and white since both the student body and faculty were overwhelmingly composed of sisters and priests in habit or clerical garb. There was little interaction between the religious orders in those pre-Vatican II days, and little time for it when everyone traveled on their respective convent buses, arriving, attending classes, and leaving together on a strict time table. Between classes, sisters studied and worked on assignments. Sr. Mary Claire recalled being in class with World War II veterans going to college on the GI Bill. She was grateful for their military service; in her own family, five cousins served in WWII so she understood their sacrifice. With no background in high school biology, Sr. Mary Claire appreciated having extra help in college-level biology from Sr. Mary Karlanne Noehring who also coached her in basketball for their PE course. Newly acquired Columbus Hall became the VMC library. Both Sr. Evelynn and Sr. Mary Claire attended classes in Talbot Hall, a converted bar. Sr. Evelynn recalled that occasionally former bar patrons visited this old haunt while class was in session. She also remembered the screen-less windows stretching from floor to ceiling in the converted residences. Sometimes the windows became easy exits when students spied a police officer on the street looking for parking violators. A quick hop out a first floor classroom could help a student move the car in time to avoid a ticket. Those windows were also a source of stress when Fr. Charles Garvey sat on the second-floor sill while teaching philosophy. Distracted students held their breath, hoping he wouldn’t lean too far and take a two-story spill to the ground below. Sr. Evelynn also described moving the library from the administration building to Columbus Hall, a former Knights of Columbus center, complete with bowling alley. Interestingly, beer crates left in the bowling alley bar were used to pack up and carry the books down the street to their new home.